Over the course of January’s 31 days, we’re making a blog stop in each country where we serve children, thanks to the generous support of our sponsors and donors. So whether you’re helping ChildFund build playgrounds in Afghanistan, provide drought aid in Kenya and Ethiopia or sponsoring a child in the United States, we hope you’ll make new discoveries about our work around the globe. Most people think of Christmas as a time to spend with family. Unfortunately, children who reside in foster homes do not have that luxury. To brighten the holidays for the foster-care children who reside in Adair County, Okla., ChildFund’s Southern Plains Area Office partnered with several local civic organizations to host a Christmas party in the children’s honor. Many of the 36 children attending had never had a chance to meet Santa or sit on his lap. Most have never had a party given just for them or received presents wrapped with pretty paper and bows. As families gathered in the Westville Pentecostal Church meeting hall, there were bright smiles as far as you could see. Foster parents and the children sat and visited before lining up to fill their plates. The delicious meal was donated and prepared by Matthew 25 House, Adair County Foster Care Association, Little Debbie’s Corp. and Harps Grocery. Adair County Child Welfare staff members served the families. While the foster parents enjoyed a meal that they, for once, did not have to cook, the children squirmed and wiggled in their seats. They would take bites here and there, but it was hard to think about eating with all the excitement and buzz that a special guest was expected to soon arrive. Community members and a few of the older foster children attempted to keep the younger ones entertained by painting characters on faces and hands. A noise was heard outside…. What was that? A fire engine? Surely not a fire on this special evening! The children raced to the door just in time to see – to their surprise – Santa and Mrs. Claus climbing down from the big Westville Fire Department fire engine. The noise level went high, with shrill giggles and laughter. “It’s Santa Claus…it really is him!” With awe on his face, one little blond boy walked right up to Santa, reached out and touched his ample belly. He turned back to his friends, grinning from ear to ear. Apparently, a belly that shook like jelly was confirmation that Santa really was real. We managed to get the children seated on the carpet and Santa in his chair. The Jolly Elf then called the children up one by one to receive gifts and a stocking filled with goodies. The local Vo-Tech center’s Health Occupations Students of America (HOSA) nursing group donated the presents. The student group hosted fundraisers throughout the year so they could buy gifts for the children. ChildFund’s Southern Plains Area Office provided the stockings and goodies. Everyone went home happy that December night. I left humbled by the magic of the evening. Our community had come together to honor the dedicated foster parents in our area and to celebrate children who are too often overlooked. Although the thought saddened me that these children would not be able to spend Christmas with their own parents, I was overjoyed to see the love these children receive from their foster families. That evening, our community ensured that these children were not excluded from the magic of giving – not just presents, but unconditional love, affection and acceptance. Discover more about ChildFund’s programs in the United States and how you can sponsor a child. At a small school in the Oklahoma countryside there is movement and bustling about — it’s the day before the last day of school. Giggles. Skipping. Laughter. Summer is around the corner! Katie is among the regional finalists in the Doodle 4 Google contest. Throughout the hallways are small hand-drawn signs: Vote for Katie. No, she isn’t running for class president or for the local strawberry festival princess. 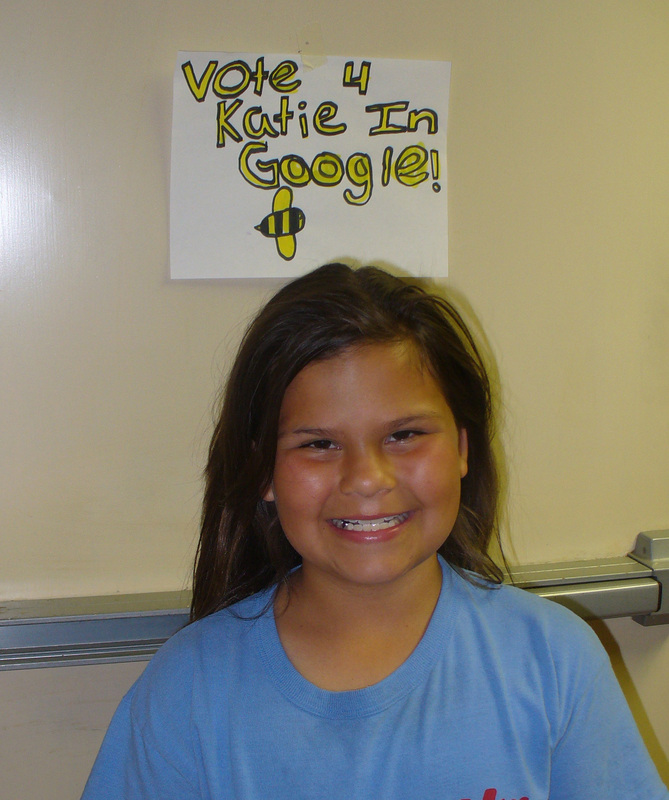 The signs are reminding students and teachers to help Katie win the 2011 Doodle 4 Google contest. Katie is one of 40 regional finalists vying for the Grand Prize National Winner, who will take home a $15,000 college scholarship and a $25,000 technology grant for his or her school. Celebrity judges include actress Whoopi Goldberg and Olympic athletes Evan Lysacek and Michael Phelps. The winner will be announced May 19. As we wait for Katie and her mother to join us in the art room, we admire the children’s paintings and drawings lining the walls. In the center of the display is a poster-size version of Katie’s Google artwork — about 5 feet high and 12 feet wide! Suddenly, in bounds a 9-year-old with high energy and a smile that reaches ear to ear. Katie is a beautiful Cherokee child, who enrolled in ChildFund’s U.S. programs in 2008. She likes sports, the color blue, animals and singer/songwriter Taylor Swift. 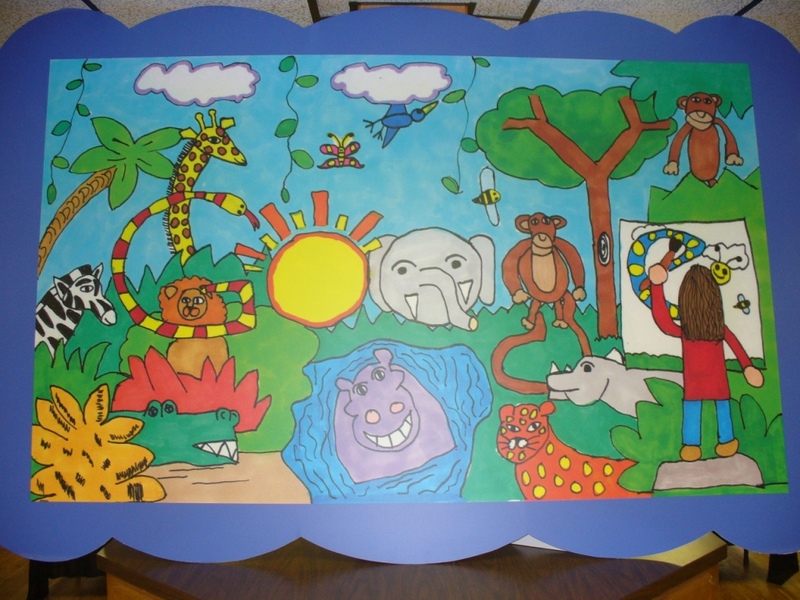 Katie prefers to use crayons for her drawings, and animals are her favorite subjects. She tells me that she likes drawing because “it is fun and you get to go places.” She means that figuratively and literally. Her artwork often depicts distant places, exotic animals and people. And by winning so many competitions, she’s getting to travel. Just the previous day, she was at the Oklahoma state capitol collecting honors for her drawing for an anti-smoking campaign. And next week she will be boarding a plane to New York City to attend the Google awards ceremony. A childhood dream is coming true through the power of self-expression. It’s been an honor to meet someone who has mastered shape, color, shading and depth. Katie is an artist! Yes, with an exclamation point! Perhaps like many of you reading this, I check my Facebook page – often. In fact, it’s a core part of my morning routine. Last Thursday morning, I read the ChildFund post about a resource center opening in Mississippi. I smiled at the good timing since I happened to be heading to Mississippi that very day. When I arrived, Elaine, our Mississippi area manager, shared some startling statistics about poverty – and, more specifically, the way that institutional systems of oppression in the U.S. and Mississippi have reinforced poverty conditions within the African American community. In the communities where ChildFund works, African Americans disproportionately experience poverty, unemployment/under-employment, incarceration, teen/unwed pregnancy and school suspension/expulsion. Related to these statistics, we learned what children in our programs personally report feeling, the risks they identified in their lives and the positive resources they seek out in their families, peer groups, schools and communities. We went on a brief tour of program areas recently affected by Mississippi River flooding, passed dilapidated closed-out storefronts and eventually pulled up in front of a small brick building that was clearly a bank turned library turned community resource center. Yes – the same resource center I had just read about on Facebook that morning. Happy dance. We met Jasmine, Toneca and Mr. Jamison. We heard firsthand how the resource center came to be — how it truly was an initiative dreamed up, advocated for and enjoyed by the youth themselves. We asked the young ladies who took the lead on this project what differences they were seeing in the community as a result of the resource center. How did other children see and treat them now that that they had made a difference? I was eager to hear why they volunteer at the center and what future goals they have. What else did they need in their communities? It was a delightful and eye-opening chat. Someone in our group happened to have an Internet-enabled phone, so we showed the girls the ChildFund article about them on Facebook. They giggled with pride seeing their names, faces and story. We sat silently for a second then erupted into applause. She was beaming. Often life is about subtle timing. I just happened to meet these young ladies in the Mississippi resource center after I had just read about it online. 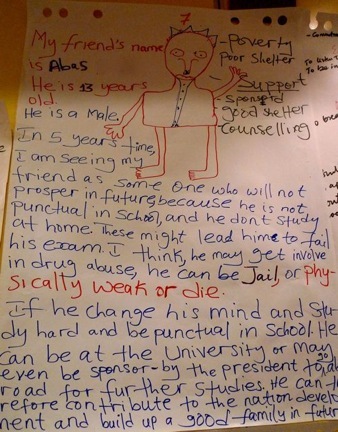 But more important, ChildFund was at work in the community right when a youth leader – a youth hero – was emerging. Perfect timing. In preparation for ChildFund’s Youth Program Summit in India, we’ve been talking to youth around the world, trying to get inside their heads to understand how they see the future unfolding, starting with their inner circle of friends. We ask them to think of and actually draw a “friend” — a peer, a relative, a neighbor — someone they know well. We encourage them to be realistic. In five years, what do they really think their friend’s life situation will be? Not what they hope, but what they predict. 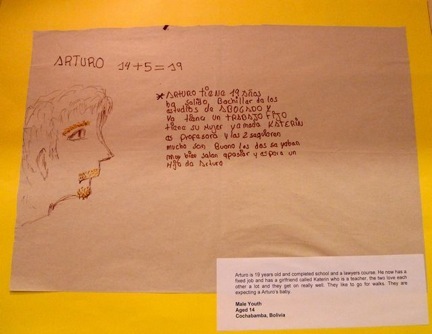 We give them drawing materials, a quiet space, and we see what happens. In the next blog, we’ll take a look at the resources young people say they need to be successful. This week marks the one-year anniversary of the U.S. government’s “Let’s Move!” campaign, spearheaded by First Lady Michelle Obama. The campaign offers concrete ideas for helping parents, schools and communities improve the nutrition of children. In addition, the Healthy, Hunger-Free Kids Act of 2010 authorizes funding for federal school meal and child nutrition programs and increases access to healthy food for low-income children. The measures Mrs. Obama’s efforts have set in motion will take some time to come to fruition. Yet, awareness is increasing of the problems associated with child obesity and action steps are under way. Children themselves are leading change in their own small ways, through planting gardens, blending exercise with education and getting hands-on kitchen experiences. Within our U.S. programs, ChildFund is helping children, youth, families and communities to increase their food security as well as their knowledge base about health and nutrition. Working alongside partners already in the communities, ChildFund is focusing on community and youth engagement approaches to hunger, proper nutrition and physical fitness. Rather than simply providing services — giving young people bicycles, for example — ChildFund adds value by engaging beneficiaries from different angles: training the youth on bicycle maintenance as well as healthy exercise and diet. Momentum is building to help children lead healthier lives. Let’s keep it moving. Last week I had an opportunity to do something I’ve always prided myself in doing — getting people to say “yes!” At a meeting of Kiwanis Club Division 25 leadership council in Chatsworth, Calif., I was invited to tell my story of growing up as a sponsored child. I also hoped to give them another reason to foster a partnership with ChildFund. The meeting was held at Los Toros Mexican restaurant (which has the most divine chili bean and cheese dip, btw! ), and the place was jumping with football fans, first dates and family gatherings. (l to r): Don Clary, Shauntay Hinton, Ron Clary and Nicolas Montano at the Kiwanis Club Division 25 leadership council meeting. I was introduced to the Kiwanis Council leaders — parents, teachers, retired entrepreneurs — all volunteering their time on a Monday evening with the common goal of making a noise in the name of serving children of the world. And as soon as the gavel hit the table, I knew there wouldn’t be a dull moment during this meeting! It was quite encouraging to see volunteers so passionately engaged in making a difference in their own communities. Just as one of the members stepped up to guarantee that this year’s holiday party committee would turn out decorations rivaled only by Rockefeller Plaza, the gavel hit again, and ChildFund was next up. Showtime! I was given a lovely introduction by ChildFund Western Region development officer, and good friend of mine, Athena Boulgarides. My goal was simple: stand before the Kiwanis members as living proof of the power of ChildFund’s efforts in local communities right here in the United States. No matter where I go in life — whether it’s meeting the President in the Oval Office, ringing the bell to open the New York Stock Exchange or gathering with concerned volunteers in Los Toros — I have to take a moment to marvel at how far this daughter of a single-parent school teacher has come from the sticks of Starkville, Miss. Then after I get over myself, I make sure I tell anyone interested in what I have to say that I wouldn’t be standing before them as a former Miss USA had it not been for the early opportunity to express myself on stage in plays produced by Brickfire Project, a community outreach development program and affiliate of ChildFund. During the Q&A, one of the Kiwanis members asked, “Is there any other way to connect with a sponsored child other than just through letters and pictures?” I was happy to tell them that ChildFund encourages hands-on sponsorship involvement by service organizations working with ChildFund on initiatives like the Brickfire Project in Starkville. That answer garnered a few smiles and head nods, and I felt I had maybe helped to connect the dots. The meeting ended with two pledges to sponsor a child through ChildFund! As a matter of fact, I’m still beaming as I write this blog. On the 33rd day of ChildFund’s 100 Days of Yes campaign, the Kiwanis Club, Athena and I had gotten two more children closer to their chance to stand tall as living proof of how ChildFund makes a difference in local communities here in the United States and around the world! Shauntay Hinton, a former Miss USA, is a television host and correspondent who has contributed to lifestyle and entertainment programming for King World Productions, Fox Sports, Lifetime and Twentieth Television. For many U.S. children, the gap between the storied American dream and the hard reality of their day-to-day lives seems unbridgeable. The current economic crisis is creating even more pressure on already struggling families as they seek to feed, clothe and shelter their children. Just as ChildFund is committed to improving the lives of children in other countries, we’ve also been at work for more than 50 years in America. Our work has taken us to some of the most impoverished U.S. communities, assisting children and families from diverse populations in South Dakota, North Dakota, Mississippi, Oklahoma and Texas. ChildFund partners with affiliate grassroots organizations that have an intimate understanding of the local community and the needs of children. Our programs are focused on early childhood development, after-school and summer enrichment activities, youth engagement and leadership, cultural arts and restoration of cultural identity, preventive health education and activities, and also parent education to help promote healthy child development. Yet, more help is needed to break the cycle of poverty in our own backyard. The cost to sponsor a child in the U.S. is $35 per month, (a bit higher than for other countries in which ChildFund works due to higher costs of providing services here at home). For more information about U.S. child sponsorship, call 800-776-6767, or visit the child sponsorship section of our website. Do a search under “USA.” (FYI: We don’t show online photographs of U.S. children to protect their privacy and ensure their safety). Many children in the U.S. are waiting for you to say “yes” to sponsorship.